Ready? Set! GO!!! 16 times Space Olympic gold medalist Froggy G is here to farm some gold with perfect technique and a brutal training schedule. Add to that a pair of supertight swimming trunks and we've got a clear winner. The Grandmaster Splash skin! 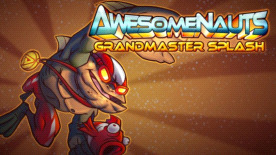 This DLC contains a custom skin for Froggy G in Awesomenauts.